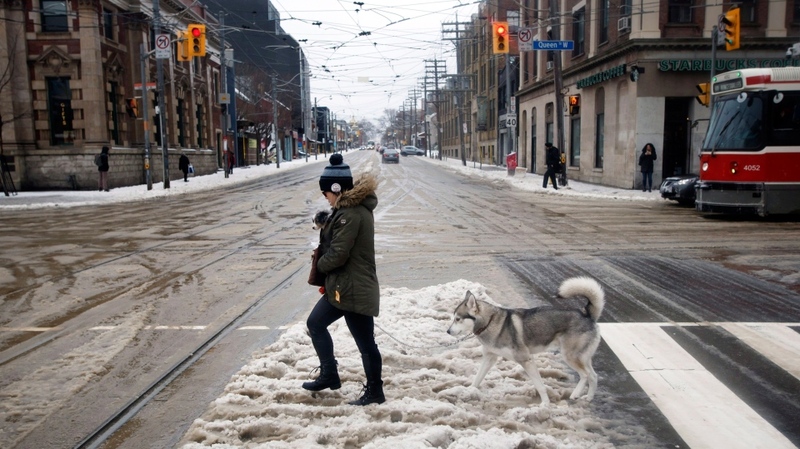 TORONTO -- Utility crews continued repairing severed power lines on Tuesday morning after a wild few days of rain, freezing rain, snow and strong wind across much of southern, central and eastern Ontario. The province's largest utility, Hydro One, was reporting around 40,000 customers without electricity -- down from a high of about 300,000 in the early stages of the storm. Just over 2,000 Hydro Ottawa customers remained in the dark -- down from about 75,000 -- and Toronto Hydro was reporting a few hundred outages by Tuesday morning. Hydro Quebec was dealing with almost 19,000 outages in Montreal and surrounding areas. The blast of winter weather also impacted the boys of summer, when a chunk of ice falling from the CN Tower poked a hole in the Rogers Centre roof, cancelling a game between the Toronto Blue Jays and Kansas City Royals. An around the tower remained roped off until Tuesday morning, when police said the ice no longer posed a safety concern.